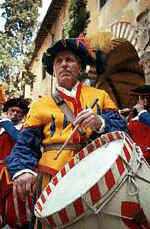 The Catholic Church held religious feasts, which were celebrated, throughout the city of Newark. They were usually held in October and November to celebrate All Saint's Day. When we lived Down Neck, they were held on Ferry and McWorther Streets. After we moved to 12th Street, and later to Avon Avenue, we would attend the feasts on 14th Avenue between Bergen and Camden Streets. 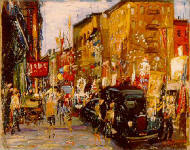 Sometime we went to the First Ward feasts, on 7th and 8th Avenues, near Park Avenue. Many a good time we had, walking, eating, looking, meeting and talking with friends and relatives. I don't remember my dad ever attending church, although my mother and I always did. My mom went to an Italian church on Ferry and McWater Streets. It was one block from the Penn Station--about a mile from our home. I went to St. Aloyisi's church on Fleming Avenue- just four blocks from home. I later became an altar boy. New York City had their religious feasts on Mott Street, or Mulberry, or Canal Street. These were always twice as large as any held in Newark. They had all the special foods cooking at the outdoor food stands. Sometimes you would see something delicious and have to ask, "What is that?" We loved the New York feasts and used to join in all the festivities. They were really nice affairs. Friendly, clean-cut, and lots of fun. Plus you got to eat a lot of that good food that was being cooked outside on the street. Sometimes we would even go there when there was no feast. My dad used to take me to New York City whenever I needed a new suit. He would take me to Canal Street where most of the clothing stores were located and he was able to wheel and deal and get some good buys for me. Of course, sometimes he would get something for himself. My dad was a wheeler and dealer when it came to buying clothing. If they had something for sale for me for $25, he would negotiate it down to $15 and he would get the deal. It seems those clothing salesmen wouldn't let you get out of the store without buying something, even if they lost money. But we used to do pretty good. On other days, my dad use to take me to Mulberry Street, where we would shop for home cooking needs. Sometimes we would buy a large five-pound can of anchovies that were packed in salt. When you opened them, you had to wash the salt off before using them. They were imported, and they were really delicious. We used to love anchovies. Sometimes he would buy a rabbit that was skinned, ready for cooking. The butcher would cut it up for us, and we would take it home and my mother would cook the rabbit. Other times it might be a small nanny goat, which they would call a kid. They would sell these on special holidays like Easter and Christmas. We would go and buy them, bring them home and cook them, and we would have a feast. I remember another place my dad used to take me to. You know how these homes in New York City were attached to one another. They had no alleys where you could walk to the rear of the building. You had to go through the hallway. One place that I remember was a three-story tenement house. We would walk through a darkened hallway to the back yard and then turn around and go down a flight of stone steps into the basement. You would see smoke pouring out of the place like they were cooking something down there. What they actually were doing was smoking nanny goats' heads, which they call "gabuzells." My father used to love those things. He'd take me in there, and they would have two or three tables where you could sit down and buy a head or two and start eating. My dad used to love to eat the brains of the goat, and the tongue, and the jawbone. The meat on the jawbone was the best. That's what I liked. I wouldn't eat anything else. But I've seen people eat eyes out of the goat's head, and things of that sort. We would sit there and each order a gabuzell, and what I didn't eat he would finish. He'd order a bottle of wine and would enjoy a little meal. A little repast in our shopping. The basement restaurant was an odd place. You wouldn't know it was there unless you knew about it. But my dad knew about it. He found out about it somehow. That was one of the nice things about going to New York with him. He knew his way around, and being just a young boy, I used to follow him and do whatever he said.